The existence of an English dub wasn't a philistine travesty demanded by subtitle-averse Americans. In fact, the original film was dubbed into Italian as well. 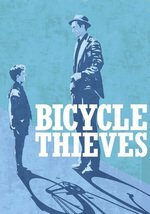 Like almost all Italian films of this time period, Bicycle Thieves was filmed silent, with all dialogue and sound effects dubbed in later. It's been suggested that this is one reason Italian neorealist movies seem so fluid: a film crew can be much more spry and agile if the director doesn't have to worry about capturing sound during the shoot. Just watched this a few months ago for the first time. Between this and Umberto D., De Sica made two of the most depressing films ever. It is amazing that most or all of these actors are untrained, you'd never know that if you weren't told. I haven't seen it in a few years. Seems almost meaningless to make any kind of comment on the most beloved movie of all time?! I can't imagine I could come up with much new to say... But all I can say is that I felt as impacted by it as everyone. Beautiful. I'm stunned that these performances were from non-professional actors, Bruno especially. One thing I'm not sure I agree with in Snider's essay on the film is his assertion, "The film is simple and heartbreaking, yet hopeful, too — because if Antonio Ricci can endure these trials without being broken, then so can we." Did Antonio endure it without breaking? It seemed to me that he was giving up hope as he walked down the street at the end. Due to my particular interests, it's kind of inevitable for me to compare this movie with pictures from the same period from Japan. One Wonderful Sunday (1947) and Record of a Tenement Gentleman (1947) spring to mind immediately. I don't think either one could be called neo-realist. Still, the bleak reality of life in a destroyed and defeated capital is well-captured by Kurosawa and Ozu respectively. Ian A.T.: The existence of an English dub wasn't a philistine travesty demanded by subtitle-averse Americans. You say that, yet every scene with a crowd sounded like a Family Guy joke about Italians. It made it hard for me because every time there was supposed to be drama, all I could think of is "Aaaaay! Shuttuppa with the shuttuppa!" Oh yeah, totally. There's lots of "It's-a me, Mario!" performances. All I meant was that the dub didn't just exist because most Americans hate subtitled films; it also exists because they were already dubbing it into Italian so (unlike most films) it was actually easier to do a dub than subtitles. The irony is that the actual subtitles on Hulu are a hilarious mess. I think they were made with a voice-to-speech program! It is amazing that most or all of these actors are untrained, you'd never know that if you weren't told. Actually, if you compare it to professional Acting! of the time, it's very, very easy to believe. It's easy to take it for granted that the goal of acting is realism, but that's an embarrassingly recent development. The only way to get a realistic performance in the forties was to hire people who hadn't been poisoned by training. I had seen this before, but I had no memory at all of the dubbing, and I have no idea how I forgot about that. The accents were kind of amusing, and I guess you can blame dubbing for that part, but they didn't dub the wild gesticulation. But some of the most over the top Italian caricatures I've seen have been in movies made by and for Italians. It does sound especially weird in English, though. That demeanor sort of tempers a lot of Italian neorealism for me sometimes, injecting a little melodrama that doesn't really strike my American sensibility as realistic, but maybe it actually is. To me, it would be insulting to slap a happy ending on the story. One of the things about neorealism is that it acknowledges that the central story isn't the only one. Marie's sheets that she pawns are just one bundle out of all those countless others stacked up on those shelves. And the way the scene lingers for a moment after she's left, on the man who comes up after Marie in the pawnshop with his binoculars, and you see all the other bicycles hanging up there when Antonio goes to pick up his. There aren't really good guys and bad guys, so if Antonio got a purely happy ending, it'd almost strike me as crass. "And then, this one specific guy's problems were all solved and he lived happily ever after, and that's what is really important, after all, so let's keep the camera tight and not let any of the rabble get into frame." De Sica does the exact opposite of this. He sends Antonio back into the background, into the crowd, as though the camera could focus in on any other random person and tell you their story next, because everyone has one.